The Moon is not visible on the date of New Moon because it is too close to the Sun, but can be seen low in the east as a narrow crescent the morning before, just before sunrise. It is visible in the low southwest the evening after New Moon. First Quarter Moon, 6:31 a.m. The Full Moon of January is usually known as the Old Moon. In Algonquian it is called Wolf Moon. Other names are Moon After Yule and Ice Moon. In Hindi it is known as Paush Poornima. Its Sinhala (Buddhist) name is Duruthu Poya. The Full Moon rises around sunset and sets around sunrise, the only night in the month when the Moon is in the sky all night long. The rest of the month, the Moon spends at least some time in the daytime sky. Last Quarter Moon, 7:57 a.m. Sun., January 2, 8 a.m.
Jupiter and Uranus have been dancing with each other for months, but make their closest approach today. This happens before they rise in daylight in North America, but they will still be very close when they become visible just after sunset. This should be the best meteor shower of 2011, because there will be no Moon in the sky. 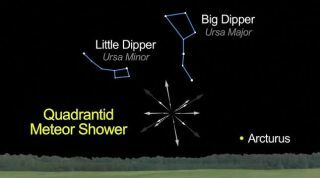 The other two reliable showers, the Perseids in August and the Geminids in December, both coincide with bright Moons, which will cut down on the visibility of faint meteors. Visible at sunrise in northwest Africa and most of Europe, midday in northern Africa and the Middle East, and at sunset in central Asia. Sat., January 8, 11 a.m.
Venus will exhibit its “half Moon” phase as it reaches its greatest apparent distance from the Sun. Sun., January 9, 10 a.m.
Mercury will be at its farthest from the Sun, making for a pair of “morning stars” with Venus. Observers on the East Coast will miss the end of these events because Jupiter will have set. Observers on the West Coast will miss the beginning of these events because of skylight. But everyone should be able to catch some of them. Mercury will be a "morning star" for the first half of the month, but will be too close to the Sun to observe for the rest of the month. This will be a poor apparition for observers in the Northern Hemisphere, but a good one for observers in the Southern Hemisphere. Venus is a brilliant "morning star" all month. It reached greatest elongation west of the Sun on January 8. Mars is lost in evening twilight, on the far side of the sun. Jupiter is well placed in the early evening, dominating the southern sky. It is in the constellation Pisces all month. It sets around 10 p.m.
Saturn rises around midnight and is visible the rest of the night in Virgo. Its rings have returned to their usual glory after being on edge for the last two years. Uranus is in Pisces all month. It had its third, and closest, close encounter with Jupiter on January 2. Neptune is too close to the Sun to be observed.